After my 10 years of living in North India, now I can proudly say that I can cook Rajma like my neighbour Kamla Aunty who is a Punjabi. I’ve not learnt this dish from her though. Rajma Masala what I cook a t home is a result of my own experiment with Rajma. I used to cook it in different style in the past; I wanted to reach that stage when I can be pretty confident about my Rajma recipe. It’s not easy for a Bengali to cook this dish perfectly. 😉 I’ve very sad experiences with my Rajma cooking. After many trial and errors this recipe is born. And this is a keeper now in my family. 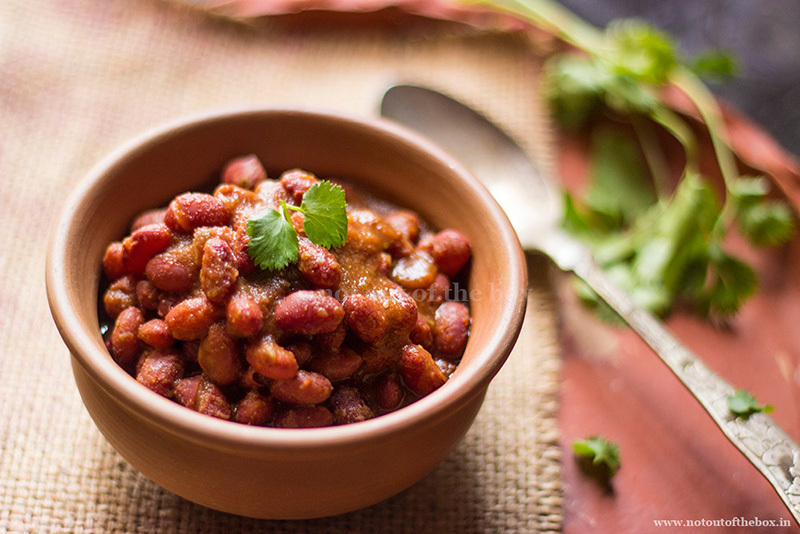 It’s a full proof recipe, which makes delicious Rajma what you can serve to guests with a bright smile on your face. It takes less time to cook. So you can cook it in a hurry. Soak kidney beans for 6-8 hours in water or soak them overnight. Wash well (3-4 times) and keep aside. In a frying pan dry fry kasoori methi on medium flame for few seconds. Grind into a fine powder using your mortar pestle. Keep aside. Make a smooth paste of onion, tomato and green chilies using a mixer/grinder. Keep aside for later use. Heat oil in a cooker. Add tomato-onion paste, sauté on medium flame for one minute. Next to add ginger-garlic paste, turmeric powder, coriander powder, kashmiri mirch powder and salt. Mix and stir until the masala starts leaving oil (for 2-3 minutes max). Now add Rajma. Mix well and cook uncovered for 5-6 minutes on medium flame. Keep stirring in between. Add 2 cups of water into this. Mix and close the cooker lid. Remove from heat after 10-12 whistles. Open the lid after the pressure has reduced. Check the consistency of curry, adjust salt if needed and check the doneness of kidney beans. They should be soft by this time. Check with one, it should melt in your mouth and the beans will appear mostly broken. If not give some more whistles. Adjust water according to your desire for thicker or thinner curry. I like my Rajma to be on thicker side. If you’re adding water, then cook uncovered for 2 minutes more on medium flame. Now add kasoori methi powder,garam masala powder chopped coriander leaves. Mix well and remove from heat. Your ‘Rajma Masala’ is ready to eat. Serve hot with steamed rice, roti, kulcha or naan whatever you like. great dish Chandrima! i will surely try this out. This is amazing! i love rajma and i am so gonna try this recipe.